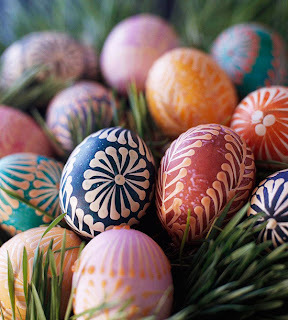 With the holidays behind us, it's time to set your sights on the year ahead and all it has to offer. 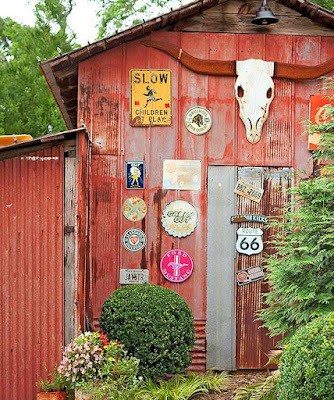 Get a jump start on new storage décor with these inspiring ideas for creating clever storage closets. 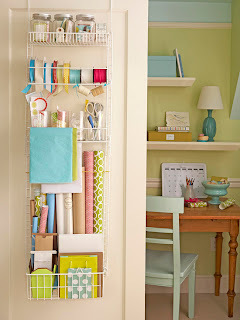 Finding a place to stow cleaning supplies can be challenging, especially if storage space is limited. 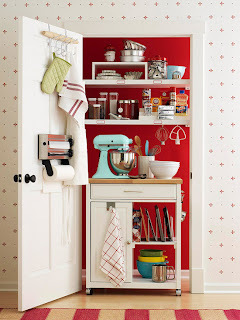 Here, a narrow closet nook corrals essential supplies near the kitchen. 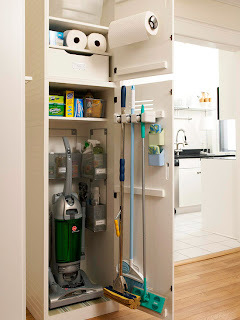 Small bins organize bottles and brushes, and a door-mounted holder secures taller tools. 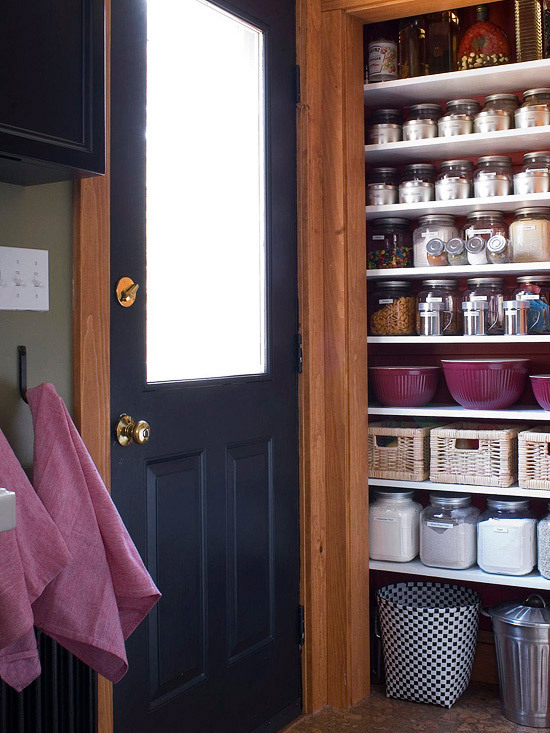 This pantry keeps organization at the forefront with storage that supports on-the-go needs. Stash favorite snacks and extra spices in lidded, labeled jars to extend freshness and ensure efficiency. 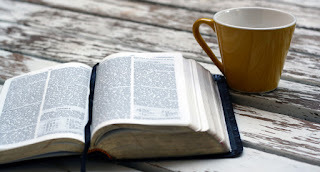 Clear containers ease preparation, giving you an easy read of what's inside. 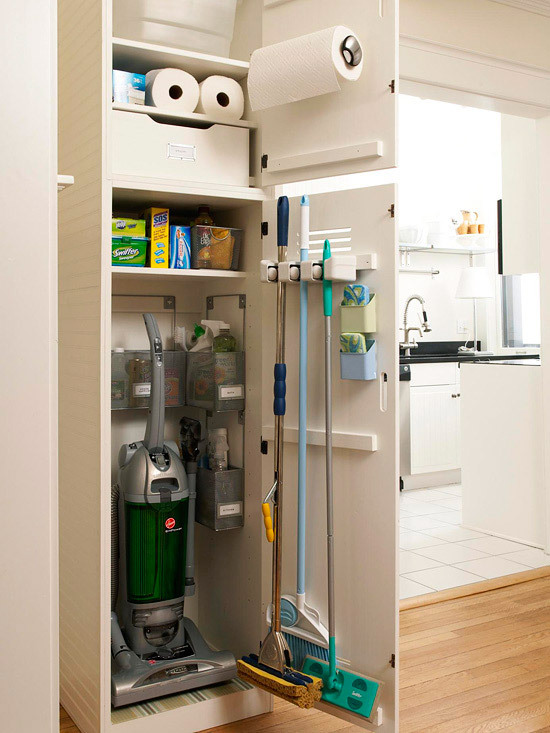 This handy closet eases prep and cleanup time by curbing kitchen clutter. A rolling cart pairs small appliances with utensils for an efficient workstation. Over-the-door hooks provide an accessible spot for dishrags and oven mitts, and a mounted towel dispenser makes for easy cleanup. 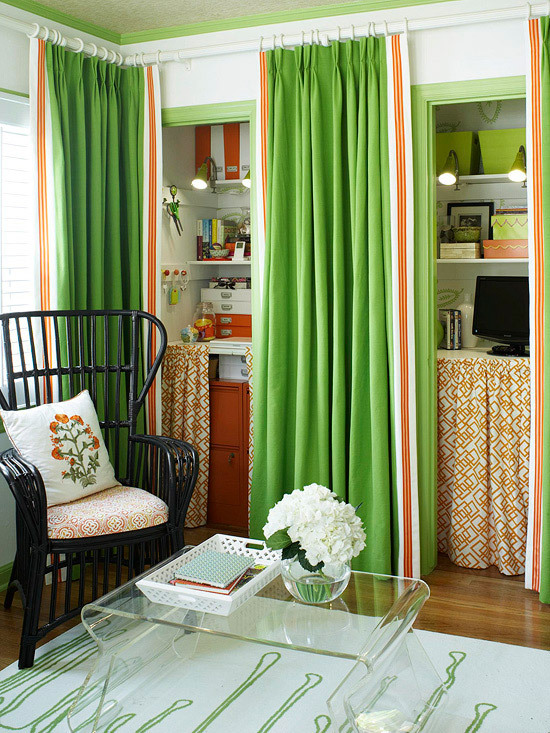 This repurposed closet reveals a chic office retreat. 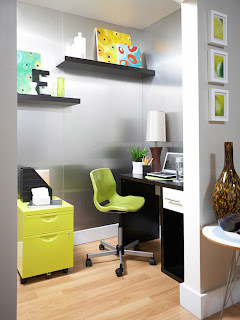 A sleek desk and a bright filing cabinet keep the space simple and task-specific. 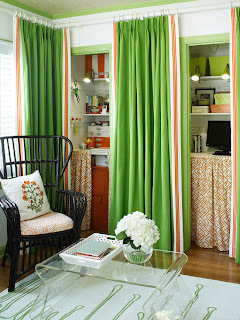 Wall-mounted shelves create more room for fun décor, and a bright rolling chair ties the color scheme together. 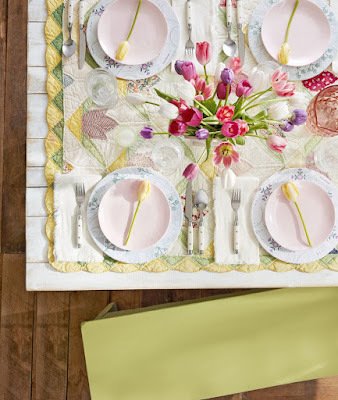 Gift-wrapping supplies can easily make a big mess. 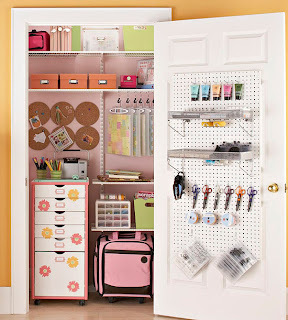 Store everything tidily in a made-for-wrapping closet unit that hangs over a closet door. The wire unit organized rolls of wrapping paper, spools of ribbon, and gift bags. 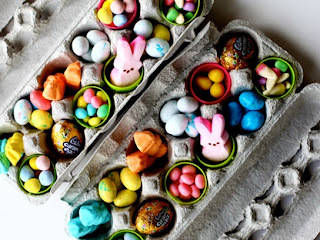 Clear glass containers keep things such as cards, gift tags, embellishments, tape, and scissors highly visible and perfectly organized. 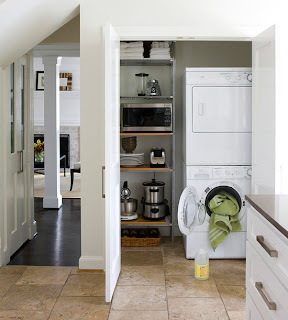 A stackable front-loading washer and dryer combo fits easily into a wide closet, leaving ample space for a freestanding shelving unit to corral linens and kitchenware. This closet's location near the kitchen makes multitasking while cooking or cleaning easy. Making space for baby stuff can be tricky. 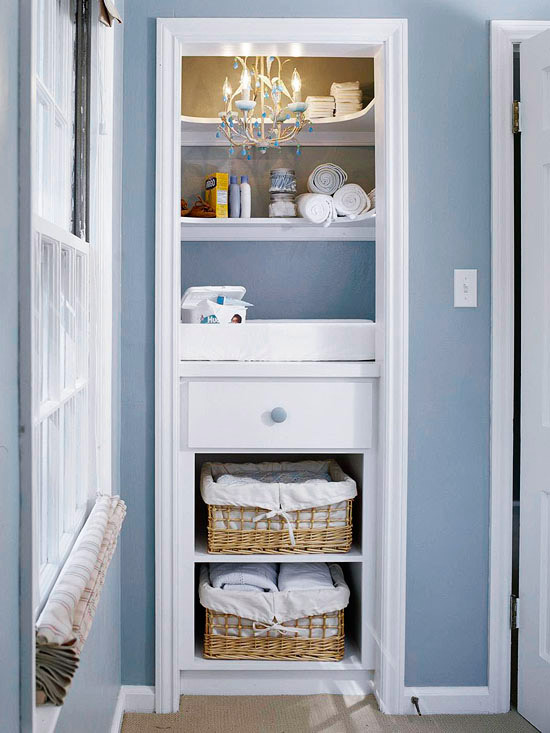 Here, a hall closet is converted into a convenient diaper-changing station. A pretty chandelier provides ample lighting and big baskets hold linens below. 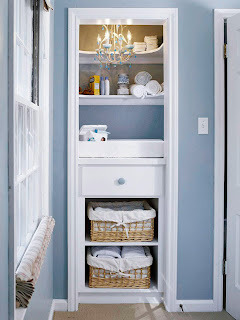 These twin closets combine storage and organization for a convenient spot to tackle projects. Labeled magazine holders and colorful document boxes are perfect for stowing project-specific materials. When you are finished working, tidying up is easy: Just draw the curtains. Fashion a creative hub in a wide closet with overhead shelves and a wall-mounted desk. 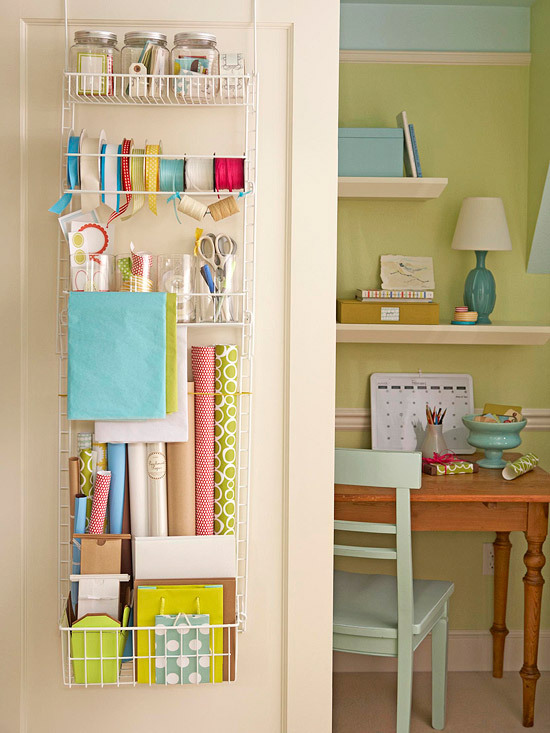 Fabric-covered paint canisters and books are pretty ways to collect project supplies, while swatch baskets below the work surface keep clutter at bay. Turn a small, cramped closet into a communication hub. 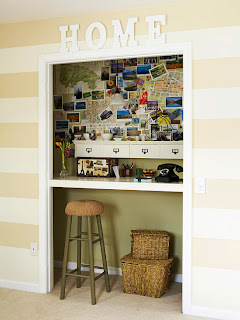 Remove closet doors and install a length of countertop at bar height. Outfit the new desk with plenty of boxes and containers to corral papers and office supplies. Tuck baskets beneath the counter and along the sides of the closet for extra storage. Make your communication hub tech-savvy by wiring electrical outlets and add a charging station to the countertop. Consider adding a phone jack to house your wireless router inside the closet, tucking all the equipment and cords out of sight. 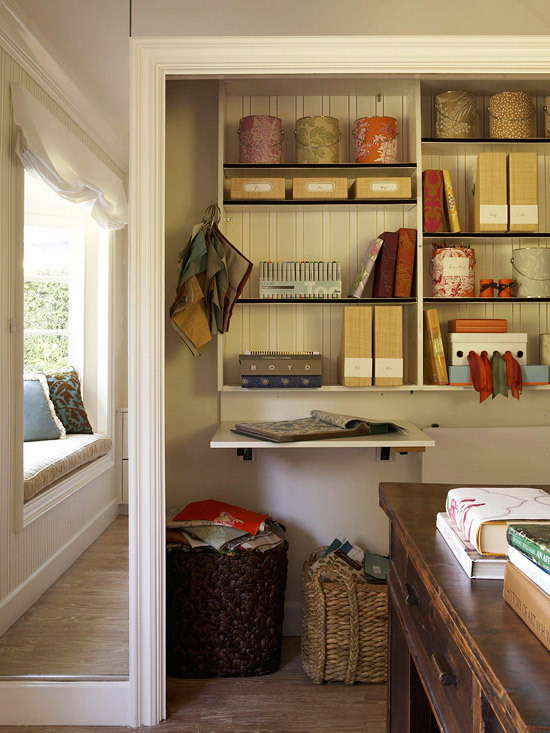 Supplies tuck away easily within this hidden crafting corner. 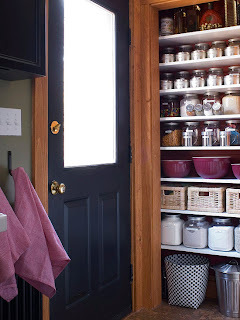 Pegboard mounted to the door provides ample storage while rolling containers make the space easily accessible.